Bartender Bob Melton based his winning cocktail on a Tia Carrere song. Tia Carrere's version of "Pua 'Olena," about the fragrant turmeric blossom, provided the inspiration for a winning cocktail. The challenge in the Outrigger's Signature Drink Contest was to create a drink based on the music of one of Hawaii's Grammy Award nominees. Carrere's "Hawaiiana" CD is one of five nominated for the best Hawaiian album Grammy. 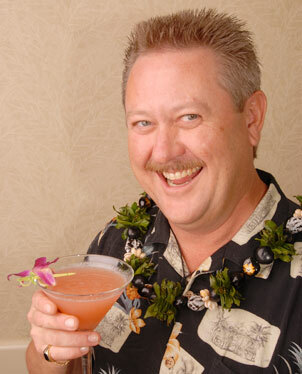 Bob Melton, bartender at Chuck's Steakhouse at the Outrigger Waikiki on the Beach, aimed to duplicate the scent of the olena -- a member of the ginger family -- with a mix of fruit juices, lychee liqueur and ginger-flavored rum. It was Melton's second victory in a row in the annual competition for Outrigger bartenders. His prize: a trip to Los Angeles next month, where his drink, also called Pua 'Olena, will be served at a private Grammy party. The drink will also be served at Chuck's all year. Pour all ingredients into a shaker filled with ice. Shake to chill and strain into chilled martini glass. Serves 1. » Rainbows win second, defeat Fresno St.